DAKSH PANWAR: One of the stories about you is that until two years ago, you didn’t know what the Olympics and Asian Games were. Is that correct? I knew about the Olympics and the Asian Games, but what I did not know was the kind of training an athlete needs to undergo. I still don’t know much. I don’t have much experience. I am just running. My father was a good footballer in Assam. He inspired me and I started playing football five years ago. Later, I switched to athletics. DAKSH PANWAR: Do you have a favourite sportsperson? I like two players: Lionel Messi and Sachin Tendulkar, the God of cricket. DAKSH PANWAR: So your talent was first spotted on the football field. Yes. My father taught me how to play football. Then I started playing with other senior boys in my village. I joined a club. Football is very popular in the Northeast. Many villages in Assam would hire me to play for them. 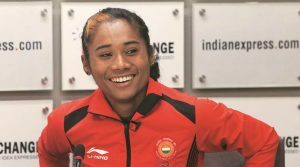 I wanted to represent India at any cost and India didn’t have a women’s football team (then). My father told me to wait as it was a big dream. I come from a small village in Dhing in Assam’s Nagaon district. The Jawahar Navodaya Vidyalaya there would organise yoga sessions and I learnt yoga for a month. My teacher taught me many things, especially discipline. I would always arrive for training in my track suit and shoes. My teacher was impressed with my attitude. He told me to switch to athletics. He said he would talk to the Nagaon Association. Later, I joined the association and participated in inter-district games. I won medals there and went on to play for the East Zone. The national games followed and now here I am. DAKSH PANWAR: What are girls of your age like back home? They are not into sports but are doing well in studies. Maybe they will take up a job in the future and then get married. ANDREW AMSAN: When you started, you wanted to participate in the 100 m and 200 m races. How did you switch to 400 m? My coaches Deepak (Bora) sir asked me to run in the 400 m category. In the 400 m event, there is an individual event and a team event. In the team event, six people can be part of the Indian team. It is comparatively easier to land a spot in the team. My coaches asked me to run in the 400 m event for some time. During one of the trainings, I clocked 58 seconds. Since I achieved the timing without any practice, my coaches urged me to take up 400 m.
When I participated in the National Games held in Chennai, I had some problem breathing as it had rained that day. But I clocked 57 seconds and that’s how it started. After that race, I joined the national camp, where I met Galina ma’am (Russian Olympic bronze medallist Galina Bukharina, who took over as Hima’s coach). After that training, I participated in the Federation Cup and did well. This is how the shift happened. The 400 m event gave me the opportunity to be a part of the six-member Indian relay team. ANDREW AMSAN: You are often seen with headphones and are known to listen to music after practice. I enjoy melodious numbers. I also listen to a lot of hip-hop and rock music. But my coach doesn’t allow me to listen to music on the field. So when I go for a competition, I listen to music during warm-ups etc. ANDREW AMSAN: You are also close to singer Zubeen Garg. Zubeen bhai and I met a year ago, and are very close since then. He came to watch the Asian Games this time. Many people from Assam came too. Even my coach (from Assam) came to see me perform. RAKESH SINHA: Do you find any difference between the training facilities in India and abroad? The Indian government has started some good schemes and I am sure that in the next two-three years, we will see a lot of athletes representing the country. DAKSH PANWAR: How are the training facilities in your village in Dhing? There is no facility. In Assam, people didn’t know what an ‘athlete’ was. Now they do. They thought athletes just keep running aimlessly. Only a few people knew about the events. DAKSH PANWAR: Which was the athletic track closest to your village? In Guwahati (137 km away). When I won gold medals in the 200 m race and long jump at inter-district events, my coaches asked me to attend a one-month government-sponsored coaching camp in Guwahati. I learnt a lot about training there. That is where I saw an athletic track for the first time. My coaches there helped me a lot. They dedicated more time to me than to their own families. SANDEEP DWIVEDI: After your win at the World Under-20 Championship, a video of your last 100 m sprint went viral. You were trailing earlier, but covered the ground in that distance. In 400 m race, the athletes don’t have the same starting position. It is at the turns, that things get even. In the Under-20 Championship, the girls were ahead of me because of their initial positions. Towards the end I accelerated, that is my natural style. Between 100 to 400 m, my mind goes blank. There is no time to think. Even I don’t know how it works. I run the way I know. The 400 m race is called the ‘King Run’. You have to finish just the way you started. DAKSH PANWAR: Have there been races where you have exhausted all your energy in the first 200 m and then struggled later? Yes, it did happen in the beginning. Earlier, I had been participating more in the 100 and 200 m events. Once, I ran at full speed for the first 100-150 metres and then got tired. It took a lot of training to shift to 400 m. You can’t shift to 400 m just like that. I practised a lot at the national camp. DAKSH PANWAR: You have been improving your timing consistently. Have you reached your best? It’s just the beginning. There’s a lot of scope. You know how much an athlete has to train to even improve their timing by a micro-second? That can sometimes be the difference between the first and the last athlete in a competition. It happened to me at the Commonwealth Games. My timing was just over 51 seconds; the same as the athlete who came fifth. The officials then checked for micro-seconds. She came fifth and I ended up at the sixth position. DAKSH PANWAR: After completing a race, do you have any energy left for more, like analysing your run etc? Only an athlete knows how it feels after finishing a 400 m race. I take a nap after that. It takes almost half an hour to calm the nerves. If I win a medal, the video (analysis) can wait. I try to give my body some rest. At the Asian Games, since I had a mixed event after the 400 m race, I tried to utilise whatever time I had to take proper rest. I could not give my 100% there (mixed relay), which is natural. I had already given my all in the first event. The good thing about the team event is that there is always support from other athletes. I haven’t had a word with my coach, who has gone on a vacation to the US, yet. We will discuss my performance and watch the videos later. TUSHAR BHADURI: You were disqualified from the 200 m semifinals at the Asian Games after a false start. Later, you said there was “tremendous pressure” from certain people. There are such people everywhere; let’s not talk about them. That day, I was also getting ready for the 4X400m mixed relay finals. No athlete can compete in two events within an hour. During my warm-up, I was constantly thinking about other events. False starts happen. Even Usain Bolt has had them, despite being such a great player. Since I was thinking about the other events so, maybe, I heard the gunshot early and made the false start. TUSHAR BHADURI: India bagged seven golds in athletics, but we lost six-seven medals to players from Qatar and Baharian who were of African origin. Should these players be allowed to participate in the Asian Games? I am very new to this world. I have very little experience and so I will not be able to answer that. It is for the federations to take a call. VINAY SIWACH: Do you feel the pressure to bag medals at such events? No. For an athlete, timing is the biggest concern, not medals. Right now I am injured and my priority is to get fit. I am playing today, maybe tomorrow I won’t. For us, improving our timing is most important. RAVISH TIWARI: You recently met Prime Minister Narendra Modi. What did he say to the players? It felt great. He has brought new policies and schemes for sportspersons and I feel in the times to come it will yield fantastic results. I was sitting near him and I could see his eyes welling up. It was such a proud moment for me. The love, respect and vision that the Prime Minister has for sports… I am sure sports has a bright future in India and we will go a long way. DAKSH PANWAR: What are your impressions of Sports Minister Rajyavardhan Singh Rathore? He has been a sportsperson too. He has won an Olympic medal, and has also served in the Army. He knows what a sportsperson needs. He is working very hard on schemes for us. He is very friendly with the players. He understands us. While we were meeting the PM, I told one of my seniors that it feels as if he (Rathore) is not a minister but one among us. Sports ministers should be like him. SHALINI LANGER: What was your experience during the mixed relay race? I had fun participating in the event. Since it was a new addition to the Asian Games, the audience had fun watching it too. We practised for the event and accordingly, it was decided who would run first and who would run last. The coach takes the decision. The players have no role in it. 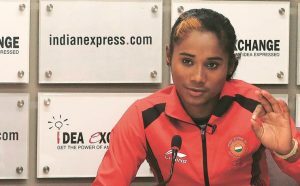 VINAY SIWACH: You have been in the company of some prominent international players such as Dutee Chand and Jinson Johnson. What did you learn from them? Asian Games earlier as well, looks after me. In the mornings, I bother Poovamma didi like a child, just as I would do with my mother. The other athletes too love me very much. I learn a lot from them. They are all very disciplined. I too have become more disciplined in their company. DAKSH PANWAR: Before the 1,500 m race, in which Jinson Johnson bagged the gold, he had rice and paneer. What do you eat before your events? Rice is my favourite. In Assam, where I come from, rice is the staple food. It gives me the most satisfaction. I like home-cooked food which is not high on spice. I mostly enjoy local, desi food. I believe that desi food gives actual strength. But yes, we have a specific diet when we travel. When I went to Poland, there was no rice or dal available there. I had to eat cabbage; at least it is healthy. I faced a little difficulty in Indonesia too during the Asian Games, but I would frequent an Indian restaurant there. Indonesia is good, but there are traffic jams just like Delhi. I hate traffic jams. SOWMIYA ASHOK: What goes on in your mind before a race? And, whose approval do you seek the most? Your parents? All I can say is that it is very scary before a race. My heart pounds. The only thing that I can think of and see after the gunshot are the two white lines between which I have to run and finish the race. As for my parents, I love them very much. I miss them sometimes and want them to be near me. But there will always be a time for that. I live in a joint family with 17 members and I am proud of it because it is rare in Assam. I miss my family, especially my twin brothers and my pet rabbit. DAKSH PANWAR: And, who do you call after a race? I call up my mother and father but they seldom pick up the phone. It is usually my siblings. When I was in Finland to participate in the U20 Championships, my parents had no idea how big the event was. In fact, nobody in our village knew where I had gone and why. 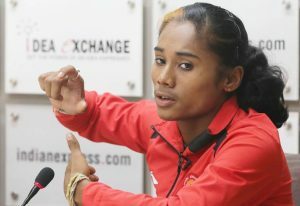 It was only after the President and Prime Minister tweeted that people in India came to know that I had bagged the gold in the women’s 400 m finals. I called up my father and asked him if he knew what I had done, and whether they were sleeping. He said they weren’t sleeping and were watching the television. I told them to go to sleep and said you will know in the morning what I have achieved. I went to sleep too. The next morning, there were several messages on my mobile phone. It made me very emotional. When I saw my pictures splashed across social media, I could not help but cry. RAKESH DAS: When you compete on foreign soil, how does it feel to see people from your state cheering for you from the stands? It can’t be expressed in words. When I won the events at the Asian Games, I took the ‘gamusa (traditional Assamese towel)’ and wrapped it around my body. The officials on the field were wondering what it was. For an Assamese, the gamusa is holy, it is an identity. A true Assamese will never lose the chance to showcase the gamusa. Let me share a little secret. I use my gamusa to wipe off sweat after practice. It has been with me for quite some time now and I never wash it. Its smell reminds me of all the sweat and hard work I have put in. It inspires me to work hard. When we met the PM, I was a little upset. States such as Haryana and Kerala were there as a team. There were many members. But from Assam, I was the only one. I hope things change at home. I have heard that the Assam government is talking of developing Guwahati as a hub for sports. If that happens, it will be a boon for the state. Chief Minister Sarbananda Sonowal also holds the sports portfolio in the state, and he has been talking about organising sporting events at the village level. Next time, for an international event, I may or may not be there, but I am sure that there will be at least 10-20 players from Assam. Previous post: THE HERITAGE LIQUORS OF INDIA… I much prefer them!